After work today I booted up my machine and watched my normal steam beta update run through its course. However today, it ended with a surprise. As the installer finished up I got a wonderful little error message, “Failed to load steamui.dll.” I tried to relaunch it to no avail. What gives? I dig through my steam folder and spot a steam.exe.bak. Hmm, maybe the older executable will work. I rename it and run it. 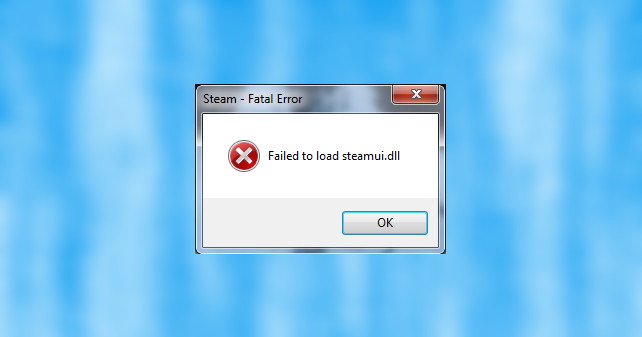 The installer runs again, “Failed to load steamui.dll”. Bummer! It’s time to pull out my trusty toolkit and off to Google I went. A lot of forum posts mentioned deleting files and reinstalling; even options to download steamui.dll from 3rd party file sites. “Great, more places to find virus!” I think to myself. Eventually I came across a post that I could stomach. This fix involves adding a flag to your target information in the steam shortcut. 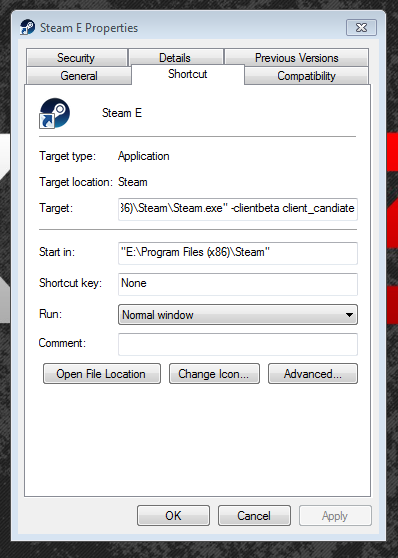 After your path in the steam executable, add -clientbeta client_candidate and click OK. Launch the shortcut again and Steam should begin to update. This resolved the issue for me yet in the course of writing this post caused me to encounter a different unrelated error which I’ll be posting on shortly.